Ahhh…much better! Emily says it was important to her to go with a classic look that would suit her “small little house,” which was built in the 1930s. 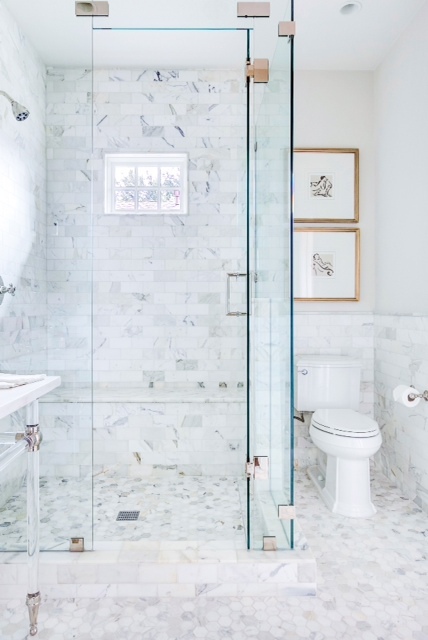 She chose Calacatta marble hexagons for the floor and subway tile that goes all the way up to the ceiling in the shower and to chair rail height on the other walls. 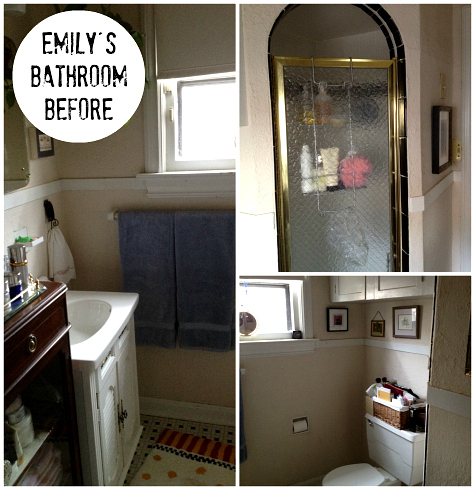 Many thanks to Emily for sharing her pretty new master bath with us! Visit Material Girls for all the photos and details. Wow! Fantastic job, Emily! 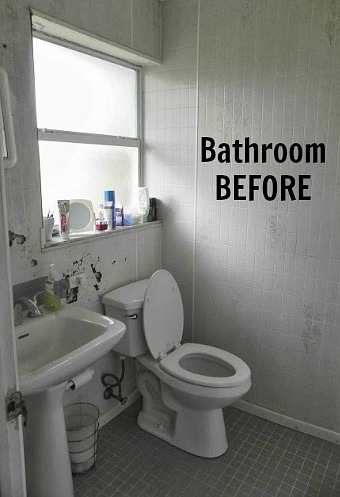 So many thoughtful little details went into this bathroom reno. I love that the overall feel is warm, even with a white and gray color scheme. The product niche is pure genius! Wow, that is gorgeous!! 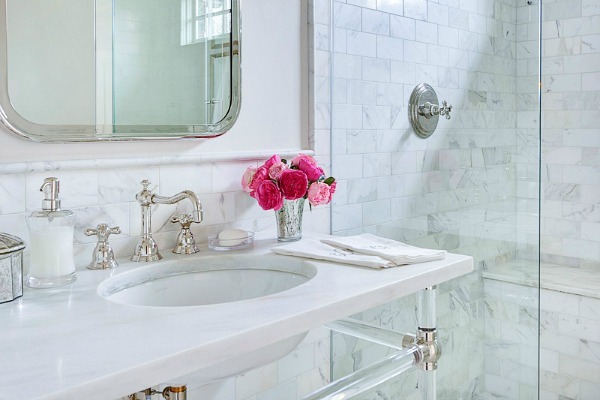 It is on my dream list to have a marble bathroom. I stayed in a hotel in NY a few years ago that had a bathroom that looked very similar to this one actually and I fell in love with it. I love it. What a beautiful transformation. And I want that mirror! Oh Restoration Hardware, sometimes I want to dislike you, but really I love you. Marble is so beautiful. I don’t have any in my house and I’m jealous! 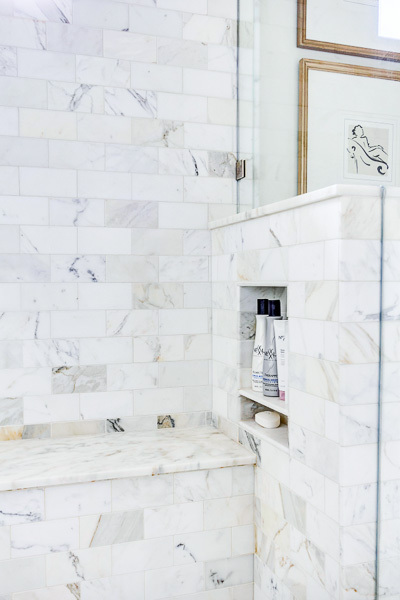 I’d never heard of Calacatta – it’s lovely. She did a very nice job (and I’d feel the same about the double sinks). The marble is gorgeous! What a beautiful bathroom! Wowzers! That is amazing! So bright and beautiful! You are hired!! Seriously, this is beautiful. WOW, so many details to love. That hidden shampoo niche is brilliant, and I love that acrylic base on the sink. I don’t think I’ve ever seen one before, but it’s beautiful and puts a glam twist on the classic. I also love that RH mirrored/medicine chest. Great job! I’m sure her “picky client” is thrilled. What a beautiful bathroom! I had no idea Calcatta gold marble existed, I’ve only heard of Carrara, but I think I like Calcatta better! Hi Julia what can I say but Emily your bathroom is perfection. 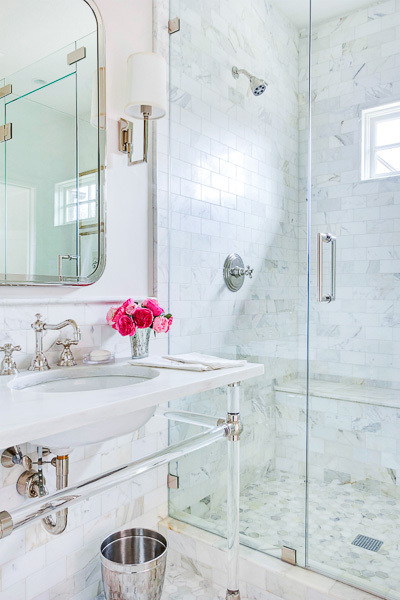 I love the marble and of course subway tiles you just can’t go wrong. The niche for shampoo bottles I regret not thinking about it when we renovated our little bathroom, very foolish mistake. Thank you for sharing this beautiful bathroom. Have a wonderful weekend. Regards Esther from Sydney. What a lovely master bath. It looks so warm and inviting now. LOVE this bathroom. 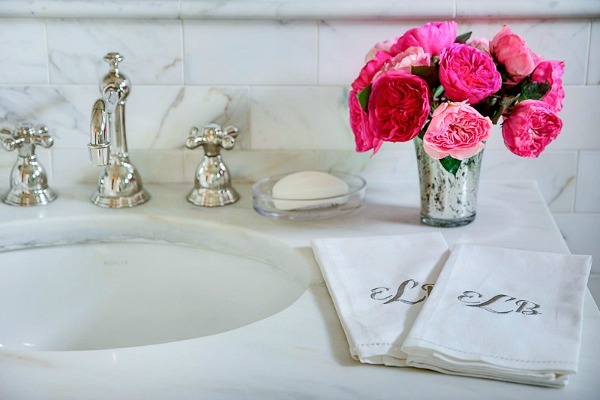 The white and marble and polished fixtures are absolutely perfect. 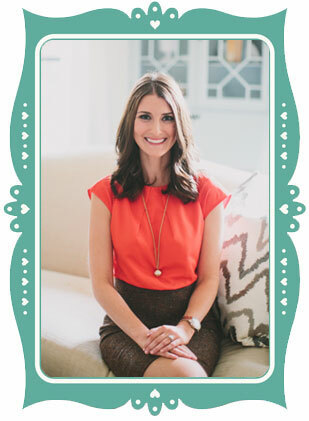 I’ve followed Emily for years and it is so fun to see her bathroom. Thank you! I’m not certain how “Friday the 13th” this post is, but I’m certain if ya hung around long enough, you’d see a “full moon”. Hahahaha hummmmm, pardon that juvenile outburst teehee. Gorgeous bathroom! Well done!! That is a lovely looking bathroom, but every time I see something like that, I think of how impractical it would be for most humans. Where does the makeup, hair stuff, tissues and dental care apparatus go? I’m just not fastidious enough for a bathroom like that one, unless I could hire a person to follow me around with a bottle of Windex and a cleaning cloth. I’d also be afraid I’d break my nose on the shower wall the first time I went in there to use the bathroom in the middle of the night, but it might just be me. I do always tend to look at things from the how difficult will this be to keep clean point of view. My first thought when I saw the pictures was if the shower walls were the easy clean, low maintenance glass. I probably need some sort of professional help. I love the IDEA of that niche for bottles in the shower. But currently I have six bottles of shampoo/ conditioner, two tubes of facewash, two things of body wash, and two different exfoliating products in my shower. Not to mention a razor, wide tooth comb and heel file. Am I the only one who felt room for four smallish bottles of product wasn’t near enough? Yes, some of us may need bigger niches for our shower products than others. Ha. Thanks for the sweet comments everyone and thank you Julia so much for including me!! Great interior designing and interior decoration! What a splendid makeover! 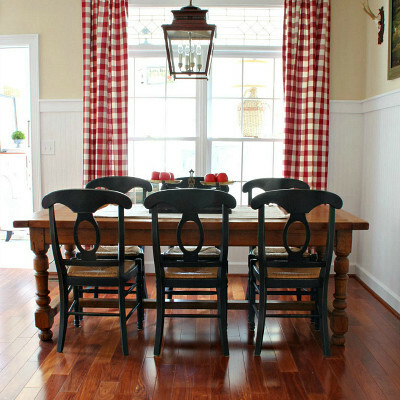 It is really lovely which gives a classic look that would suit for small house. 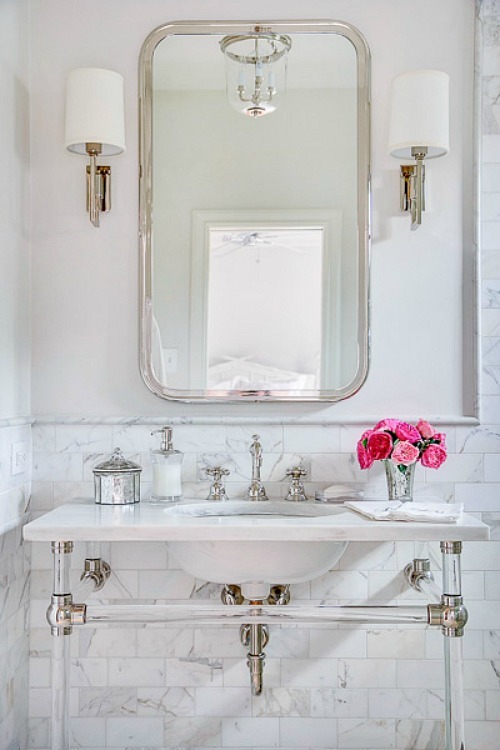 The white, marble, and polished fixtures are perfect. I love your bathroom. Wowzers! That is amazing! So bright and beautiful! Thanks for this post. What a spectacular remodel! I’m really loving all marble bathrooms myself these days. We’ll be remodeling our bathroom sometime in the next year so I’ll be sure to share photos! 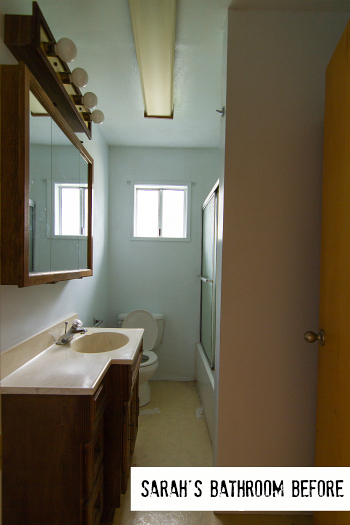 We’re just starting to build & have a similar plan for a 5×8′ guest bathroom. I’m curious what the dimensions of your room are? Gorgeous job!